OK. I do realise there’s every chance this post will not make me popular but I feel obliged to say something, since so many of you have asked. I Heart London is the last book in the I Heart series for now. There are several reasons for this, the most important being that when I started writing it, I really felt like I’d finished telling Angela’s story and didn’t want to take the piss out of you or her by stringing out her adventures needlessly. Who wanted to read I Heart Blackpool where Angela loses a Louboutin while riding the donkeys, Jenny fell in love up the Blackpool tower and Alex rode in on the number 17 to save the day under the illuminations? Well, me actually but the point is, I thought I was done. The thing is, once I’d got about halfway through and knew how things were going to pan out, I realised there were still a million things for Angela et al to get up to. That said, I still think she (and I) need a bit of a rest, if only some time off to get up to new trouble. Unfortunately for me, there’s no time for time off. If I stop writing, my hands seize up and my friends start hitting me around the face with their handbags because I start talking too much. Even more than normal. And so, I’m currently busy working away on something very shiny and very new, the title of which will be announced shortly. I promise it’ll be funny and romantic and full of new friends to fall in love with and one day, in a couple of years, Angela and Alex will be back. I have everything crossed that you’ll like it and honestly, the idea of putting out something new is genuinely terrifying so I really, really need you on side with this. Please? Does that sound like a fair deal? 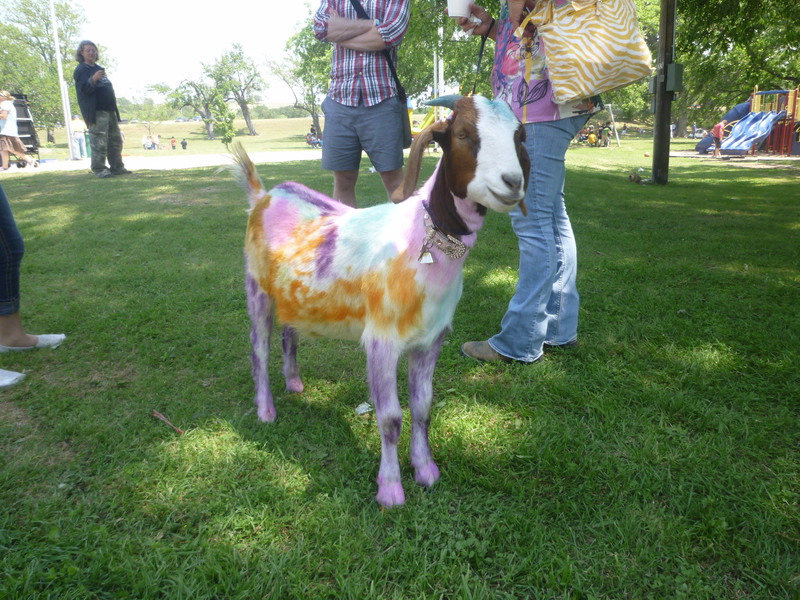 And failing all else, please accept this photo of a tie-dyed goat I met at the Goldthwaite, Texas goat festival. I, for one, have no problem whatsoever with your plan (not that you need or desire my approval). I enjoy your writing because I get the feeling of getting to know your characters as though they are real. I look forward to your newest venture, whatever it is. Although part of me hated this post for obvious reasons, It would be great to read more books by you. After all we fell in love with Angela and her adventures, who knows we could find ourselves head over heels once again. Good luck to you Lindsey and I can’t wait for your new book! I am so excited to see what you are writing next. While I love the I Heart series I actually loved Single Girl’s To Do List more so I am so excited for what’s coming! I love the I heart series and the single girls to do list, is there any way you would write a follow up to that one day? I love Angela, Alex and Jenny! But i also fell in love with Rachel so i think i will fall in love with your new book too! I forgive you. Can’t wait for your next big thing. You write scatty dysfunctional less than perfect girls perfectly! Loved the single girls to do list just as much as the I Heart series because you also write rat bastards and dishevelled hero’s perfectly too. Love anything you write, but not gonna lie – I’ll be v excited to see Angela back eventually. That’s because you’ve done what you set out to do, and made us fall in love with her and the rest of the characters. Good luck with new idea! I`m waiting to read it 😉 All I Heart series are great and Girls list too. The goat more than made up for this in my opinion. Looking forward to your newest book…but I will hold you to your promise that Angela and Alex will be back one day. Look forward to your new book and know that it will be as brilliantly written as are your other wonderful books. Patience is a virtue and will happily wait until Angela is back in however many years. Thank you so much for the tie-dyed goat. But I guess it’s a good idea to take a break or otherwise it’ll never end. Looking forward to your new book! 🙂 Yay!! I’ve just finished I heart London, amazing!! Which is what bought me here, looking for any information on if there was going to be a follow up, I can understand you wanting to do something ‘new’, but please don’t forget about Angela and Alex! I would love to read another book with them involved! Good luck with the new book and no doubt I will be buying that when it’s out! I have to say I was disappointed to read “The End” at the end of I Heart London, but after reading this post, I can’t wait until Angela and the gang return with new adventures. It has been an awesome series. Good luck with the upcoming book, I absolutely love your work!!! But actually, once I have started, I can never stop! So I am looking forward to all of your stuff, Angela or not – I am excited! I am loving the I Heart series… one problem though… I didn’t realise it was a series when I picked it up in the store. I have actually managed to read it backwards!! I picked up London as I am going to London in 4 weeks, I will have to check out Angela’s list! Then Paris (I liked London so much had to read Paris, plus aforementioned impending visit). Now reading New York! Seems the books in Australia don’t show they are part of a series! !